Types of relationships are important to understand. Choosing right type of relationship between activities will help in developing a realistic project schedule. Also you need a sound understanding of relationships if you need to compress a schedule. One of the schedule compression techniques involves changing the type of relationships between activities to fast track them. Before you continue, it is important to understand the concept of predecessor and successor activity. You can read this topic in detail by following the link below. Now lets look at the types of relationships in detail. 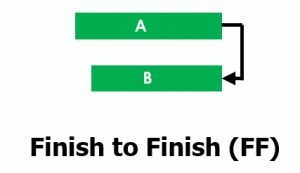 In finish to start relationship, start of successor activity is controlled by finish of predecessor activity. For example you can build foundations of a building after you have done excavations. Or you can test a software after you have developed it. In Finish to Start, relationship arrow originates from finish of the predecessor and finishes at start of the successor. FS relationship doesn’t mean that successor activity can only start after predecessor activity has finished. It only means that start of successor activity is controlled by finish of predecessor activity. In FS relationship, successor activity can start before the finish of predecessor activity if lead is applied to successor. For example you can start building foundations when 75% of excavations are completed. You don’t have to wait for complete excavation to start your foundations. This type of relationship is mostly used in the schedule. If you are confused about exact relationship between activities then go for FS relationship. 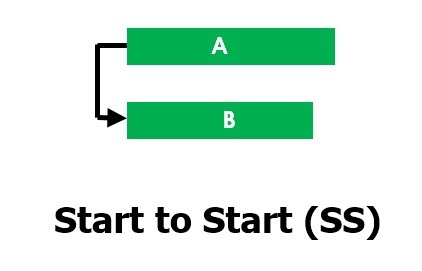 In start to start, start of successor activity is controlled by start of predecessor activity. For example when a project starts then project management activities are also started with it. Or you can start leveling of concrete when pouring of concrete is started. SS relationship doesn’t mean that successor activity can only start when predecessor activity has started. It only means that start of successor activity is controlled by start of predecessor activity. In SS relationship, successor activity can start after the start of predecessor activity if lead is applied to successor. For example, if construction of walls and plaster on these walls are connected with SS relationship, then to start plaster, some portion of the walls must have to be completed. In finish to finish, finish of successor activity is controlled by finish of predecessor activity. For example you may want to finish columns with walls so that roof can be built over them. Or you may want to finish all testing of a software with writing of a software manual so that final software package can be handed over to the client. You can also you lag and lead in FF relationship if you want to finish successor activity before or after finish of the successor activity. 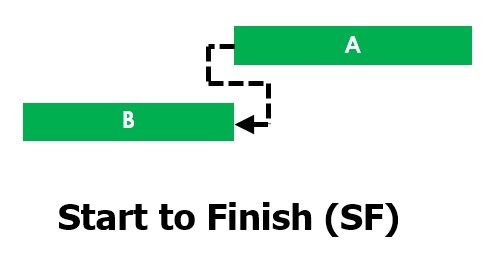 In start to finish, finish of successor activity is controlled by start of predecessor activity. Example of FS relationship can be that you have an activity of floor tiles in your schedule, lets say activity A, and you create an activity of material approval process for this activity and connect it to activity A by start to finish. Now you will have start and finish date of this material approval process so that the process can be initiated on time and you have approved tiles till start of tiling works. So now you have understood all types of relationships. Happy learning and do comment or subscribe if you have liked this post.